When you wish upon a jackpot, makes no difference who you are – of course, it does make a difference which slot game you play. One heck of a swell slots game chock full of special features and, dare we say, magically lucrative bonus payouts is Blueprint Gaming’s Wish Upon a Jackpot. 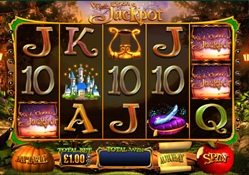 Wish Upon a Jackpot is a “greatest hits collection” sort of slot game, with bits and pieces taken from familiar fairy tales – some of them not even popularized and warped by Walt Disney movies. It’s also colorful, playful and, again, full of bonuses and special features. How much can I play the Wish Upon a Jackpot slot game for? Well, you can play the Wish Upon a Jackpot slot game for absolutely free right here at Demo Slot Machines. Should you wish to play for real money, you can wager 1¢ to $25 per payline on the 20 paylines, for a top bet of $500 per spin. How do you play Wish Upon a Jackpot? Three scatters (the storybook) launch a “pick ‘n’ win” round in which the player chooses one of four fairy tale books and is awarded win the “3 Little Pigs Free Spins” (in which symbols are turned into sticky wilds until – get this – The Big Bad Wolf blows them away); the “Rapunzel Free Slots” (retriggerable free spins with increasing bonus multiplier); “Rumpelstiltskin’s Deal Maker Bonus” (it’s a lot like the old “Let’s Make A Deal” gameshow); and the “Jack and the Beanstalk” video round (in which a jackpot payout of 1000x the total bet is possible). As though this weren’t enough, your fairy godmother is also ready to lend a hand. Any spin can trigger the randomly-awarded “Fairy Godmother” bonus. Said magic sugar mama conjures up three magic orbs. Pick one, click it, and you’re awarded with “Pinocchio Wilds,” “Puss in Wilds”, “Wild Reels” or a “Fairy Win Spin.” Any is certain to land a crazy big win. 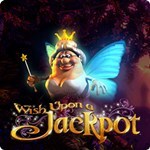 What is the top payout in Wish Upon A Jackpot? Where can I play Wish Upon a Jackpot slots? Try any of our partnering casino websites to play for free or for real money!